Officially known as the Commonwealth of Puerto Rico, Puerto Rico is an unincorporated territory of the United States situated in the Caribbean Sea. It's about a thousand miles off the coast of Florida and is part of the Greater Antilles region of the Caribbean, being home to around 3.4 million people spread out across various islands, including the main island of Puerto Rico itself and other islands like Mona and Culebra. Puerto Rico is a place with a very rich and fascinating history, having been discovered by famed explorer Christopher Columbus in the late 15th century and colonized by the Spanish, but contested by other empires like the French and British over the years. Puerto Rican people are citizens of the United States, and since Puerto Rico is a territory of the United States, Americans can visit the island territory freely. Puerto Rico is a beautiful place and has become a popular tourist location, especially with United States citizens, due to its gorgeous Caribbean beaches, exciting wilderness areas like El Yunque National Forest, rich array of flora and fauna, delicious cuisine, lively annual festivities, and wonderful cities like the capital of San Juan, home to various old forts like the Castillo San Felipe del Morro and the Castillo San Cristobal, as well as the Old San Juan historic district and the thriving Condado nightlife area. With so much to see and do all around this island territory, Puerto Rico appeals to visitors of all ages and offers lots of different accommodation options to suit all kinds of traveler, including a nice array of affordable hostels. The hostels of Puerto Rico can be found all around the area, with many focused on the city of San Juan or located in beautiful beachside places. 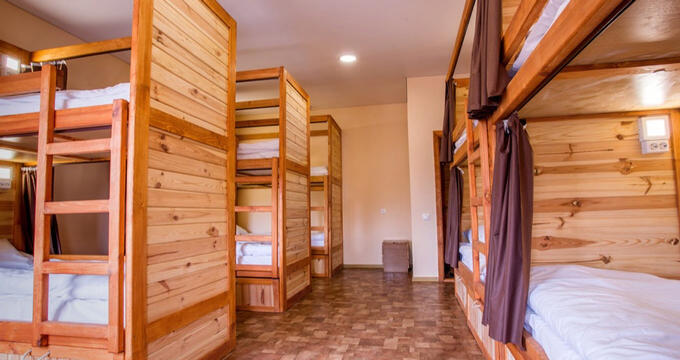 These hostels offer low cost dorms and rooms, with many also providing additional facilities like internet access, laundry machines, and more. Read on to find out more about a few of the best hostels in Puerto Rico and start planning your Puerto Rican vacation today. In a prime location near the Ocean Park area of San Juan, the Nomada Urban Beach Hostel is one of the top rated hostels in all of Puerto Rico and really excels in terms of comfort, cleanliness, design, and location. In short, this is an amazing place to stay, and the room rates are really attractive all through the year too. You'll find the beautiful sands and waters of Ocean Park to be about 5-10 minutes away from this hostel, with the popular Condado area only a short taxi ride away as well. The hostel itself offers clean, comfortable rooms and dorms with shared bathrooms, also featuring a stunning rooftop terrace area with amazing views, lots of comfortable seats, and tables to enjoy meals with your friends. You can even choose to camp out in a tent on the rooftop if you like, with several other balconies dotted along the side of the building too. Located in the exciting, vibrant Condado neighborhood of San Juan, the Mango Mansion is another very highly rated Puerto Rico hostel. If you're heading to Puerto Rico to enjoy the sights and sounds of the capital city, this is the place to be. The local area is filled with trendy bars, clubs, and restaurants, with lots of fun ways to pass the time and party into the early hours. Some good beaches and cultural spots are also within walking distance of this Puerto Rico hostel. The Mango Mansion hostel features surprisingly tasteful decoration, with the dorms even featuring chic, industrial-style bunk beds and attractive art works on the walls, along with desks and simple storage solutions. You'll be able to chow down on a free breakfast in the mornings and can also hang out in the communal courtyard/patio area with your pals or cook up some treats in the spacious shared kitchen. A lot of people choose to go to Puerto Rico to simply get away from it all and enjoy a few days or weeks of relaxation, and that's exactly what you'll be able to get at the Lazy hostel. Located in the Esperanza area down on the southern coast of the main island, this hostel is perfect for trips to the beach. The warm waters of the Caribbean Sea are just over the street, with some soft, welcoming, powdery sands waiting to greet you too. The Lazy Hostel is a simple, no-frills place but it does feature comfortable rooms, clean beds, good quality bed linen, and some simple amenities like a friendly bar to hang out with your buddies and a nice lounge space with cozy chairs. There's also a communal kitchen to cook up some food and you can get free Wi-Fi access throughout the building. Many of Puerto Rico's hostels tend to be situated in and around the capital city of San Juan, but there are other hostels all around the coastline of the main island too, including the Grateful Souls Hostel, which is located in Aguada, out on the western coast of the island, not too far from the big city of Mayaguez. There are some super beaches in the area, with Crash Boat Beach being a fine example, and you can also check out the Punta Higuero Lighthouse or have some water-based fun at the nearby Las Cascadas Water Park too. The Grateful Souls Hostel is a pet-friendly Puerto Rico hostel that offers free breakfast to all guests and features comfortable, air conditioned rooms and facilities. There's actually a fitness center at this property, complete with exercise machines and weights, so it's a good place to be if you like to do your daily workouts and stay in shape. The building in which the hostel is housed is very attractive too, featuring lots of wraparound balconies and tall windows. All in all, it's a great place to stay for your trip to Puerto Rico.